After a 50th anniversary season in 2012-13 that featured a fairly unadventurous line up, Seattle Rep is lumbering into season 51. This year’s offerings are again mostly straight down the fairway. There seems to be little spirit left from the former glory days of Daniel Sullivan, and many offerings are more or less the same franchised products (or imports) that you can find anywhere else in America. But the good news is that the season opener for 2013-14, a riotous rendering of Carlo Goldoni’s THE SERVANT OF TWO MASTERS (the Yale Rep production) featuring several imported stars from the former Minneapolis powerhouse Theatre de la Jeune Lune, is a sight to behold and probably NOT something you’re going to find just anywhere. From the first moments, it’s clear this show is aiming for the rafters, and it mostly gets there. Directed by Christopher Bayes and starring Steven Epp (both Jeune Lune alums), SERVANT is jam packed with stock jokes, some of-the-moment references, and even perilous improv. Though there is a plot, a show like this succeeds or fails as a result of what the actors bring to just being on stage with each other, and the all star cast assembled here lights up the comedy big time. Steven Epp as Truffaldino feels like a national treasure. He is so good he simply holds the audience in his hand whenever he’s on stage. We can’t wait to find out what he’ll do next. With a raspy voice and a full toolbox of physical gesture, Epp has clearly done this sort of work before and is in his element. Amazingly, he does all this while being mostly masked the entire show, a somewhat strange directorial decision. 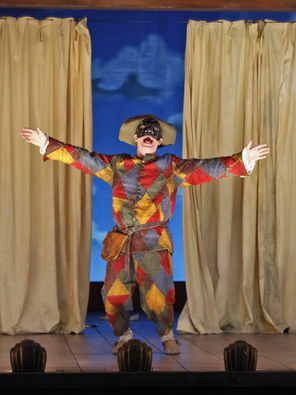 Surely a man this talented from the commedia tradition has some great facial expressions. When Epp emerged unmasked for the curtain call, I found myself wishing we could have been watching that face out in the open all night. Still, even fully masked, Epp is fantastic and radiates a link to an older era of theatre as he keeps this classic farce on track (until it goes off the rails). Steven Epp as Truffaldino. Photo: Richard Termine. Helping out in the over the top department is Allen Gilmore as Pantalone. Gilmore, too, is a master, and though he is similarly masked most of the time, he is so expressive and hyper it doesn’t matter. Everything he does is at 11, and he keeps events unfolding pell mell. He is out of control. But in a good way. Gilmore must burn about 2000 calories a night. And then as Beatrice there is the stunning Liz Wisan, who could be a leading lady on any stage in the world. No mask on her face, thankfully, and the power, control and speed she displays here are formidable. Wisan is absolutely tremendous and a joy to watch up close. Jesse J. Perez as Florindo puts the grease in greaseball, oozing sexual desire (if not appeal) all over the stage. There’s a bunch of other actors in the mix, and also a live musical duo on the side of the stage providing effects, soundtrack, and some wry feedback as events bubble ever higher. Add in a few moments of stage magic, and Seattle Rep has a hit on their hands with the first show of the year.